There are different ways of notating topic maps graphically, in addition to GTM, listed below. One recently developed example is Topic Maps Martian Notation. TMMN (its acronym) is a simple graphical notation used to explain the Topic Maps data model, and map out both ontologies and representative instance data. It is designed for use on whiteboard or paper, as well as within any diagram-based software including everyday presentation tools such as PowerPoint and LibreOffice Impress. 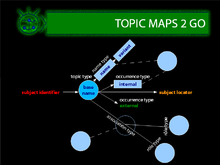 TMMN uses only a very small number of symbols – "blob", "label", "line", "dotted line", and "arrow" – to represent the relationships and basic elements of the topic maps model: topics, names, associations (and roles), scope, and occurrences (including subject identifiers and subject locators). The "Martian" refers to the archetypal "Martian Scientist", namely, the ability to communicate knowledge across linguistic and cultural barriers, known and unknown. It was developed as part of the musicDNA project. Advanced Topic Maps Martian Notation is currently under development by the musicDNA community and includes shorthand notation for various types of whole-part relationships. ^ "Home of SC34/WG3 – Information Association". 3 June 2008. Retrieved 26 December 2009. ^ ISO. "JTC 1/SC 34 – Document description and processing languages". ISO. Retrieved 25 December 2009. ^ a b Lars Marius Garshol (2003). "Living With Topic Maps and RDF". Retrieved 21 February 2014.